While trying to stop a cyber-attacker stealing all Space Team’s hard-earned money, the cyborg, Mech, unlocks a secret partition in his hard drive, revealing a mysterious set of co-ordinates. 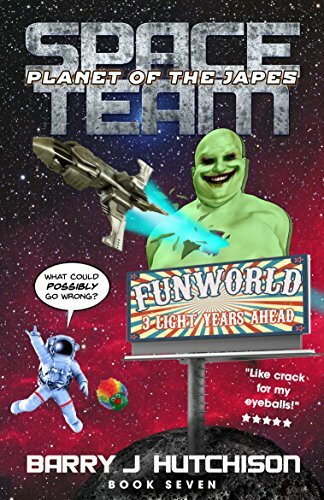 The co-ordinates lead the team to Funworld, a planet-sized theme park with a worrying number of artificially intelligent clownbots, and a shocking disregard for Health & Safety. As the author notes at the end, this is different from the Universe-shattering last story and concentrates on the ‘Space Team’. The characters are now well established and the fast talking jibes flow easily. The story is a bit different, you never know where it’s going (I don’t think the author knew until the final scenes). But overall it keeps up the humour and light-hearted adventuring.